What?!?! Seriously, who do you think you are? My guess is at least a hundred if you’ve asked it once… am I right? The other day, I got an email from a friend and colleague in my business group who I saw last week at our live quarterly meeting in CT. Basically, she was chatting with another one of our friends and they were impressed that I showed up at the event 3 days post surgery. For me, it was really the only option. This is the time I set aside to really work on my business. Mastermind, grow, and learn with and from other six- and seven-figure entrepreneurs. This is where the magic happens and I love it. So, I didn’t think twice about it. I wasn’t comfortable during it. At. All…but that’s just part of what is. But I thought about it for a second. I guess, I mean, in some way, sure. Defying the rules of recovery? Pretty badass. Taking all the surgeries and tumors and not-so-awesome-stuff in stride with an “I’ve got this” approach? I guess that’s badass. We entrepreneurs are hard on ourselves. It’s not just the balance that has us doubting. So many of my clients struggle with believing they know all that they really and truly know. They don’t think they can do all the things that they need to do to be successful in their business. They wonder, they doubt, they freak. They forget their badass. And the thing is…it’s EASY for others to see our badass. Because it’s SO obvious to others. 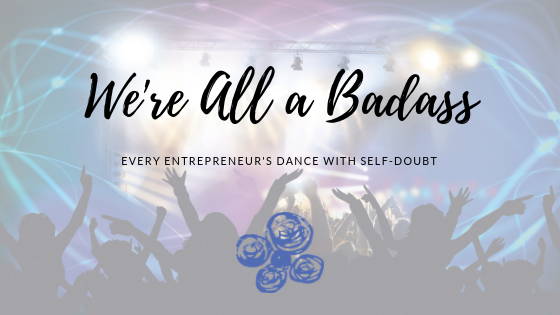 Our badass is what we do best when we’re just being us, doing what we do best, doing our work like we do, serving people, making widgets, changing lives…whatever your work, you do it in your very own, completely badass way. So we take it for granted. Like first responders who run into danger when everyone is trying to run away from it…they don’t think of themselves as badass…it’s just what they do. Every day. Because it’s who they are. No fanfare or recognition needed (or wanted). Badassery at its best! This used to be me more than I’d like to admit. And although it tries to creep in, I’ve learned to reframe the doubt. To remember the badassery. And I will say, the quickest way to get past this self-doubt to wild success is having the support you need. Like my friend and fellow badass, Shannon, that sent me that email. She’s in my “tribe” if you will. The value of the tribe is amazing, and when you find the right one that helps you grow your super amazing business, it totally changes the way you look at the entrepreneur life. We’re creating our tribe of authentically badass entrepreneurs every day. Curious if it could be your tribe? Let’s talk.